Citation Information: J Clin Invest. 2015;125(7):2690-2701. https://doi.org/10.1172/JCI81589. Current stem cell–based strategies for tissue regeneration involve ex vivo manipulation of these cells to confer features of the desired progenitor population. Recently, the concept that endogenous stem/progenitor cells could be used for regenerating tissues has emerged as a promising approach that potentially overcomes the obstacles related to cell transplantation. Here we applied this strategy for the regeneration of injured tendons in a rat model. First, we identified a rare fraction of tendon cells that was positive for the known tendon stem cell marker CD146 and exhibited clonogenic capacity, as well as multilineage differentiation ability. 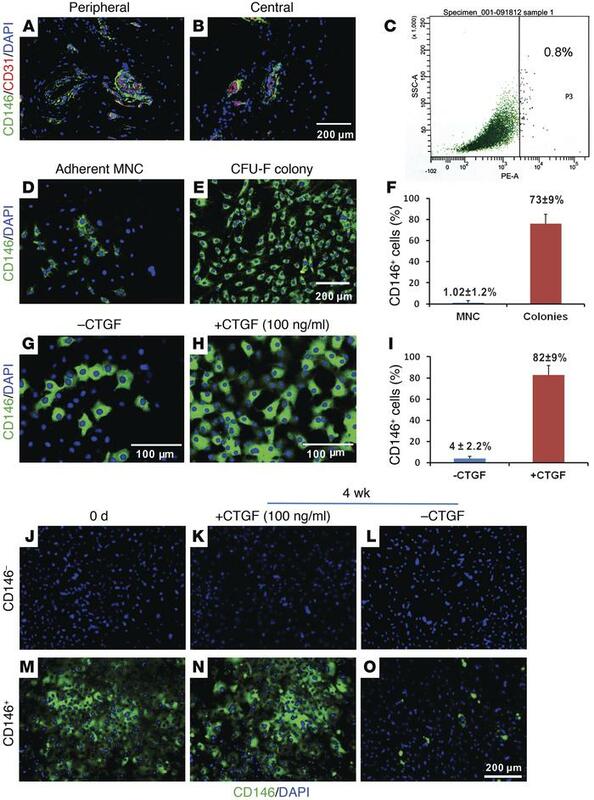 These tendon-resident CD146+ stem/progenitor cells were selectively enriched by connective tissue growth factor delivery (CTGF delivery) in the early phase of tendon healing, followed by tenogenic differentiation in the later phase. The time-controlled proliferation and differentiation of CD146+ stem/progenitor cells by CTGF delivery successfully led to tendon regeneration with densely aligned collagen fibers, normal level of cellularity, and functional restoration. Using siRNA knockdown to evaluate factors involved in tendon generation, we demonstrated that the FAK/ERK1/2 signaling pathway regulates CTGF-induced proliferation and differentiation of CD146+ stem/progenitor cells. Together, our findings support the use of endogenous stem/progenitor cells as a strategy for tendon regeneration without cell transplantation and suggest this approach warrants exploration in other tissues. Immunofluorescence revealed CD146+ cells surrounding blood vessels in rat PT (A and B). Flow cytometry showed that approximately 0.8% of isolated cells from rat PT are highly positive for CD146 (C). Approximately 1% of adherent MNCs from PT were CD146+ (D and F), whereas approximately 72% of CFU-F were CD146+ (n = 6 per group, P < 0.0001) (E and F). Treatment with 100 ng/ml of CTGF significantly increased the number of CD146+ cells (G–I). In addition, in vitro fate of CD146 expression was regulated by CTGF. CTGF treatment for 4 weeks failed to induce any CD146 expression in the sorted CD146– tendon cells (J–L). Sorted CD146+ tendon cells maintained CD146 expression with CTGF treatment by 4 weeks (M and N). However, CD146 expression was diminished in CD146+ tendon cells cultured for 4 weeks without CTGF treatment (O). All data are presented as mean ± SD. Images were selected as the representatives of 6 replicates total.